Winter Solstice 2017 – You are a Star! Empower all ingredients for Good Fortune. Wish upon the sunflower seeds for good fortune and place the seeds in the very bottom of the cauldron along with the 3 pennies. Add all other ingredients on top. You can even place some around the outside of the container for visual appeal. Use the cauldron/container as a centerpiece for your ritual and other family functions. Put your red empowered candle in a fire safe holder and place on top. Burn for ritual, or during your family dinner, or both! After the holiday, bury all contents in the ground on your property — save the sunflower seeds in a special bag. Plant them in the spring after danger of frost is over. The alignments this year for Winter Solstice are full of power and promise that we can use to our advantage! For those on the east coast, Winter Solstice occurs at 11:28 AM EST — for those on the west coast the time will be 8:28 AM PST. What magick will unfold at the moment of this powerful astrological event? You are the holder of the focus. Here are some facts about the activity in the heavens this day, and an idea or two of how you might use this marvelous energy. Winter Solstice dawns with four planets in fire signs, three in water, two in earth and one in air – with the highest house concentration in the public eye. That means that the thrust of this event is about public activities; however, remember that good roots run strong and deep — this will be a time for you to nurture your roots so that in the future, what you present to the public will be amazing! New Moon/First Quarter Aquarius fills the day with its own vibrant energy that dances to innovative ideas, new trends, divination, dream interpretation, freedom, divinatory pursuits, and equality. Saturn (the planet of structure and reward) is in conjunction with the Sun in Capricorn and as this is the powerful alignment of Winter Solstice? You have a tremendous opportunity to focus your mind on safe, secure structure for yourself and family. This is the moment of birth of the Winter Cycle, where the light of our days will grow again. This is the seed time within the mother’s womb, where internal changes are encouraged and celebrated. The light sparks love vibrations into the soul of our being. From now to Spring Equinox – this is the transformation of the core self – if you accept it and work at it, you will emerge with wishes granted and light encompassing the totality of self and family. What representation can you create in ritual knowing that this is your chance to change? This is also the time of the Wolf Moon, the Moon of Winter – and you may wish to put a wolf statue or picture on your altar. The Wolf is an amazing totem animal, caring for “the tribe” of friends and family. The Moon is in Lunar Mansion 24 – The Star of Fortune – The Mother of Creation – a most fortunate time! Energy and what is needed for yourself and family will be provided – have confidence and work for the good – Green and Gold may be your primary colors of choice today. Core active energy is in the form of a stellium (the combined power of the Sun, Venus, and Saturn – although Venus is out-of-sign in Sagittarius). The two strongest planets today are Mars and Saturn – use Mars for the power and personal drive and Saturn for the rewards due from your work. The theme for today? You are a star! The contributions you can make to yourself and your family are truly unending. It is your perception, for good or ill that drives you forward or digs you under. Take the time, perhaps, to make a Mother Candle — a pillar candle that as it burns, another candle is placed on top. The base candle — the pillar — is the Mother, and it is this candle that you fill with an overall intent — like joy, or healing, or personal transformation. Candles subsequently burned atop, relate to the main intent; but, can have other uses as well, keeping in mind that your main intent floods into the current request. Winter Solstice occurs in the Hour of the Moon — a supportive emotional energy filled with love and protection. The last dialogue to today’s Aquarius Moon is a sextile with Venus in Sagittarius, pulling laughter, love, and “attraction” energy into your life. The day — Thursday — is ruled by Jupiter and carries an edge of mercy, joy, and benefits to you — as Jupiter is in Scorpio — this energy runs deep, oh so very deep. Tap into the flow of universal strength, courage, and well-being. You are a star, brilliant in design, amazing in the grace that only you can give to others. Touch the core of this light within yourself! May this day bring joy and laughter, strength and stability, and a lasting positive change for you! PS: Have you visited Silver’s online shop? Whispermagick.com is the name! 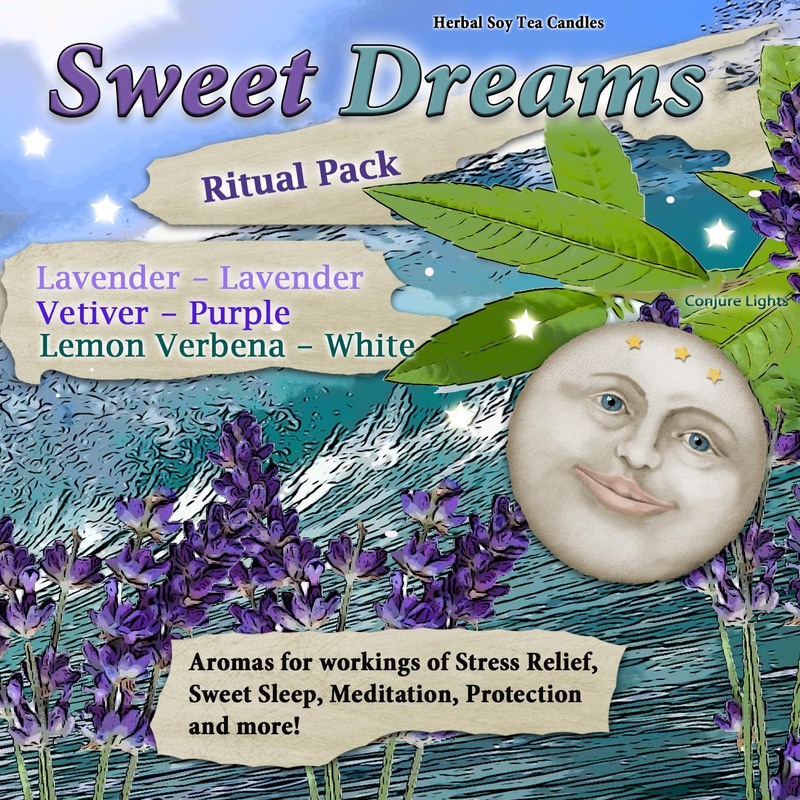 This week she is featuring her candle magick Sweet Dreams packs. Lemon Verbena – Let the Release Begin! Thank you for sharing with us. Great.